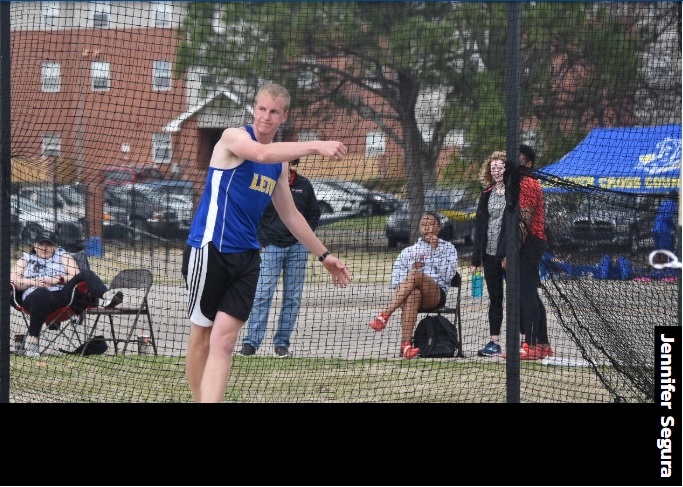 COMMERCE, Texas – Scoring eight top-10 finishes, the LeTourneau University men’s track and field team finished with 23 points to tie for eighth-place in the 16-team East Texas Invitational held on the campus of Texas A&M-Commerce in Commerce, Texas on Saturday, April 14. LETU got off to a quick start, scoring 15 points in the pole vault following a second-place finish from Alex Hindman (4.62 meters, 15 ft. – 1.75 in.). A third-place finish came in from Austin Parrish (4.62 meters, 15 ft. – 1.75 in.) and eighth-place finish from Cole Ironside (4.17 meters, 13 ft. – 8.25 in.). Other scoring finishes for the YellowJackets included a seventh-place finish from Keishaun McMillian (39.80 meters, 130 ft. – 7 in.). There was an eighth-place finish from Michael Brooks (38.93 meters, 127 ft. – 9 in.) in the javelin throw while Austin Coblentz earned one point for his eighth-place finish in the 3,000-meter steeplechase (11:11.10). The other four spots for LeTourneau came from a sixth-place finish in the hammer throw from Steven McDonell (38.19 meters, 125 ft. – 3 in.) and an eighth-place finish in the triple jump from Javaughn Dantzler (13.35 meters, 43 ft. – 9.75 in.). Just missing out on scoring points for the YellowJackets was McDonell in the javelin with a ninth-place finish (38.42 meters, 125 ft. – 5 in.). Arvin Hrushka showed up in both the pole vault (3.87 meters, 12 ft. – 8.25 in.) and shot put (9.46 meters, 31 ft. – 0.5 in.) following 10th-place finishes. LETU would also get a top-10 finish from Derek Byler in the 110-meter hurdles (16.96) while Hrushka finished just behind him in 11th with a time of 17.72. Other finishes in field events saw Brooks (1.73 meters, 5 ft. – 8 in.) and Hrushka (1.63 meters, 5 ft. – 4.25 in.) finish 12th and 13th, respectively in the high jump. McMillian came in 12th in the shot put (8.45 meters, 27 ft. – 8.75 in.). The javelin also saw Adrik Kling (33.18 meters, 108 ft. – 10 in.) and Olson (31.00 meters, 101 ft. – 8 in.) compete. Also, McDonell had (33.56 meters, 110 ft. – 1 in. ), Kling (31.19 meters, 102 ft. – 4 in.) and Hrushka (30.20 meters, 99 ft. – 1 in.) all competed in the discus. A trio of athletes would also compete in the long jump for LeTourneau. Dantzler had (6.57 meters, 21 ft. – 6.75 in. ), Stanley Williams (6.50 meters, 21 ft. – 4 in. ), and Nate Berlandier (6.16 meters, 20 ft. – 2.5 in.) all turning in personal-bests. Over on the track, LETU’s best-finish came from the 4×100 meter relay team consisting of Berlandier, McMillian, Dantzler, and Williams who finished 11th with a time of 44.93 while Williams turned in a 14th-place finish in the 100 meters with a time of 11.12. Also competing in the 100 meters was Dantzler (11.64) and Olson (12.40), while Michael Field turned in a time of 4:29.49 in the 1,500 meters. Other events and marks recorded by LeTourneau athletes on Saturday saw Daniel Shen in the 400-meter hurdles (1:04.79). Olson in the 200 meters (25.53) along with Lorien Nightingale (2:05.12), Nathan Glastetter (2:08.43), and Wesley Anderson (2:08.96) in the 800 meters. COMMERCE, Texas – Competing in their final meet before turning their efforts to the American Southwest Conference Outdoor Track and Field Championships, the LeTourneau University women’s track and field team turned in three top-10 finishes at the East Texas Invitational held on the campus of Texas A&M-Commerce in Commerce, Texas on Saturday, April 14. 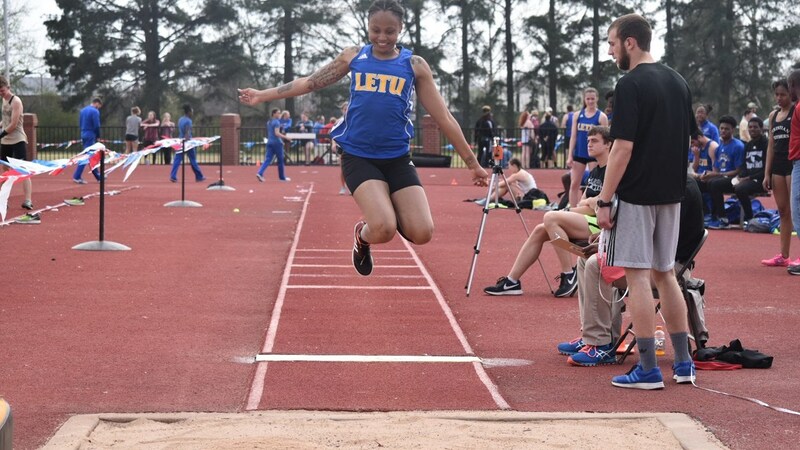 As a team, LETU scored two points in the 20 events that scored for a 16th-place finish in a meet that featured a variety of NCAA Division II, III, NAIA, and NJCAA schools. The best finish of the day turned in by the YellowJacket women came from the 4×100 meter relay team consisting of Tori Field, Crystal Jones, Kennady Poling, and Ro Galloway who took eighth-place with a time of 54.15. Jones would go on to be responsible for a 10th-place finish in the long jump with a mark of 4.92 meters (16 ft. – 1.75 in.) along with Alexis Segura, who finished 10th in the 800 meters with a time of 2:30.05. In the field events, LeTourneau had five athletes compete in the javelin throw led by sophomore Rebekah Stevenson who just missed out on a top-10 finish by placing 11th with a mark of 25.02 meters (82 ft. – 1 in.). Melanie Shempert would turn in a mark of 22.97 meters (75 ft. – 4 in.). Lexi Funk followed with (20.63 meters, 67 ft. – 8 in. ), Carrye Funk (19.22 meters, 63 ft. – 1 in. ), and Riley Blok (47 ft. – 9 in.). The field also competed in the long jump (4.77 meters, 15 ft. – 7.75 in.) and 100-meter hurdles (17.78) while Stevenson went on to be LETU’s top finisher in the hammer throw (30.54 meters, 100 ft. – 2 in.). Alicia Griscom was the only other YellowJacket athlete to compete in a field event, finishing with a mark of 27.02 meters in the hammer throw (88 ft. – 8 in.). Track events saw Lexi Funk (19.08) and Melanie Shempert (19.67) both compete in the 100-meter hurdles, while Galloway (12.92) and Jones (13.78) both turned in near personal-records in the 100 meters. Kennedy Keer turned in a time of 2:32.12 in the 800 meters in her only event of the day, while Lexi Funk went on to compete in the 400-meter hurdles and turn in a time of 1:15.75. The final game of the day featuring LETU track and field athletes was the 1,500 meters, with Kirstiana Welch (5:30.00) and Allison Fuller (6:15.84) both competing for the YellowJackets. LeTourneau will compete in the ASC Outdoor Track and Field Championships for the first time in school history next week, starting on Friday, April 20th, The meet will take place in Abilene, Texas on the campus of McMurry University. JACKSON, Miss. – Scoring five runs in the top of the ninth inning would not be enough for the LeTourneau University baseball team, falling by a final score of 10-8 to Belhaven University at Smith-Wills Stadium in Jackson, Mississippi on Saturday, April 14. The defeat drops LETU to 18-14 overall and 10-8 in the American Southwest Conference while the Blazers earned their 11th win of the year to improve to 11-21 overall and 7-13 in the ASC. A low-scoring start to the game saw both teams score one run in the first inning, with the YellowJackets using a leadoff single and sacrifice fly while Belhaven took advantage of an LETU error and sacrifice fly to tie the game heading to the second. Belhaven then took their first lead of the game in the bottom of the third, using back-to-back one-out singles to put runners on the corners before another sacrifice fly put the score at 2-1 in favor of the Blazers. Belhaven added a single run in the bottom of the fourth with a solo home run to make the score 3-1 and broke the game open with four runs on four hits and an error in the fifth to take a commanding 7-1 lead over LETU. Three more runs by Belhaven in the bottom of the sixth put the score at 10-1 in favor of the Blazers after the first four batters of the inning all safely reached base. After being limited to just two hits through the first seven innings of play, LeTourneau would finally see the bats start to wake up in the top of the eighth with a Jacob Jones solo home run and Gonzalo Sosa RBI single to cut the lead to 10-3. The seven-run deficit heading to the ninth would be a tall task for LETU but saw their first six batters of the innings reach base despite collecting just one hit with a Noah Mahoney leadoff double. With the first six batters safely reaching base, LeTourneau brought the game-tying run to the plate with no outs in the inning but saw a double play put the YellowJackets down to their last out. Following a walk and error by Belhaven that would bring home another LETU run and make the score 10-8, a walk and groundout would end the game with the Blazers narrowly holding on to victory. The eight runs for LeTourneau came on just five hits, with a majority of the offensive production coming from nine walks and two hit batters. Of the five hits, no YellowJacket player had more than one hit in the game, with Sosa driving in a team-high two runs. Only six of the ten runs allowed by LETU as Belhaven took advantage of two YellowJacket errors which led to four runs. They used a combined seven pitchers between the two squads, with LeTourneau using three pitchers including Bryce Brueggemeyer (4-4) who took the loss after throwing 4.2 innings. Kolbey Sharpe (0.1 innings) and Ryder Lognion (3.0 innings) also saw action on the mound. The final two-week stretch for the YellowJackets begins next Friday, April 20 when LeTourneau travels to Pineville, LA to take on Louisiana College to open a three-game series starting at 6:00 p.m.
MARSHALL, Texas – Wins at number one doubles and number one singles would not be enough for the LeTourneau University men’s tennis team, falling by a final score of 7-2 to East Texas Baptist University in Marshall, Texas on Saturday, April 14. LETU falls to 3-13 overall and 0-4 in the American Southwest Conference while ETBU picked up their fourth win of the year to improve to 4-9 overall and 3-1 in the ASC. Christian Farris and Jimmie Henson teamed up to pick up the only doubles point that the YellowJackets would secure, earning a 9-8 (8-6) victory at number one doubles. The Tigers would wind up taking the number two, and number three doubles match as Robby Bundy and Zac Crowley-Kurth fell 8-3 at number two doubles while Nash Best and Dale Wallace had a near miss in an 8-5 defeat at number three doubles. Farris would go on to also secure what would be LeTourneau’s only singles point, doing quick work at number one singles with a 6-2, 6-3 victory. The turning point of the match came at number two singles as Henson would battle back from a first-set defeat to force a third set before ultimately dropping his game 3-6, 7-5, 2-6. After taking the 3-2 lead, ETBU would go on to win the final four points of the day with Bundy falling 1-6, 3-6 at number three singles. Crowley-Kurth dropped a 0-6, 0-6 decision at number four singles, Collin Patterson falling 1-6, 0-6 at number five singles, and Cameron Wall falling 3-6, 0-6 at number six singles. LETU will return home for the first time in four matches, playing their regular-season finale against Louisiana College at 2:00 p.m. on Friday, April 20. 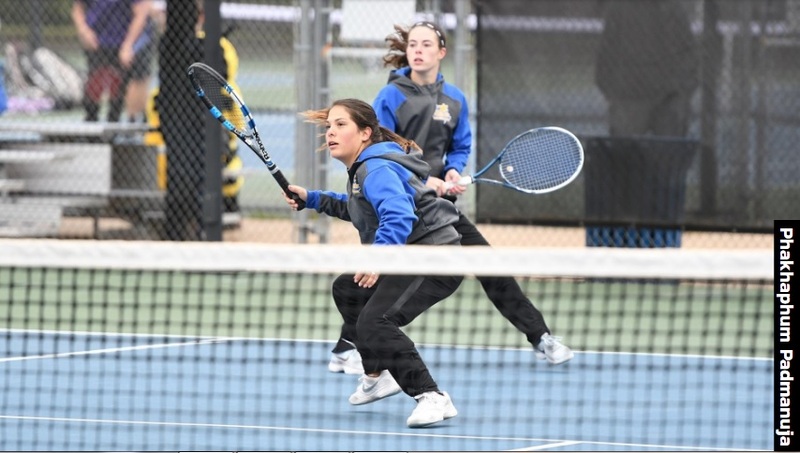 MARSHALL, Texas – A night after picking up a 9-0 victory over Belhaven University, the LeTourneau University women’s tennis team could not carry over momentum in an 8-1 road loss at East Texas Baptist University in Marshall, Texas on Saturday, April 14. With the loss, LETU is now 7-9 overall and 2-2 in the American Southwest Conference while the Tigers improved to 4-9 overall and 3-1 in the ASC. The YellowJackets fell behind 3-0 after doubles matches and could not overcome the deficit as a strong ETBU doubles lineup proved to be a tall task to battle. Maddison Brackenreg and Terin Murray fell by a score of 8-4 at number one doubles while Gracie Favela and Katy Hall dropped an 8-2 decision at number two doubles. East Texas Baptist then secured an 8-1 victory over Lauren Rockwell and Samantha Trevino to go up 3-0, needing just two singles matches to win the match. LeTourneau would pick up their lone point of the day at number six singles, with Trevino fighting back after losing the first set 1-6 to win in three games 1-6, 6-4, 10-5. Other scores from singles play saw Brackenreg drop a 4-6, 1-6 decision at number one singles while Murray fell by a score of 2-6, 0-6 at number two singles. At number three singles, Favela dropped her match by a score of 1-6, 2-6 and Rockwell fell 0-6, 3-6. Hall did win the first set of her number four singles game before falling in three sets 6-0, 4-6, 2-10. Just one more regular-season match remains for the YellowJackets, which will take place next Friday, April 20. LETU will host Louisiana College for an ASC match at the Davis Tennis Courts starting at 2:00 p.m.
JACKSON, Miss. – A seven-run fourth-inning broke game one open for host Belhaven University in a 10-8 defeat before the LeTourneau University baseball team bounced back to take a 9-4 win in game two to earn a doubleheader split at Smith-Wills Stadium in Jackson, Mississippi on Friday, April 13. The split leaves LETU at 18-13 overall and 10-7 in the American Southwest Conference while the Blazers now sit at 10-21 overall and 6-13 in the ASC. LeTourneau appeared to be in full control of the game early on, scoring two runs on a Bubba Valdez two-RBI single in the top of the first before adding two more runs in the top of the fourth on an Eli Birriel two-RBI single to make the score 4-0 in favor of the YellowJackets. Four of the first five batters for Belhaven would reach base in the bottom of the fourth, leading to a seven-run inning for the Blazers on eight hits and one LETU error after sending 11 batters to the plate. A three-run home run for Belhaven in the bottom of the fifth made the score 10-4 in favor of the Blazers, capping off the 10-straight runs scored by the home team. LeTourneau would fight their way back into the game by scoring four runs on three hits in the top of the sixth, with Will Bradshawdelivering with a two-RBI single. The four-run sixth for the YellowJackets would not be enough, however, as the Blazers shut down LeTourneau the rest of the way to hang on and claim the series opener. LeTourneau stranded five base runners in the game, striking out a total of five times and not collecting a single extra-base hit. Belhaven’s 15-hit performance included three extra-base hits while limiting their strikeouts to just three in the game. 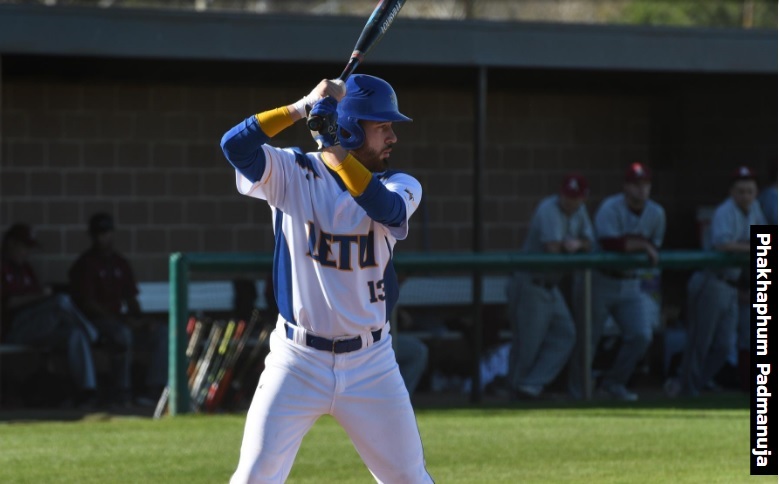 Despite taking the loss, LETU stole six bases in the game and saw three players collect two hits with Bradshaw, Brandon Ramirez, and Birriel all going two-for-three at the plate. Belhaven took a 1-0 lead on a solo home run in the bottom of the first before seeing the YellowJackets take a 4-1 lead in the top of the second thanks in part to three hits and one Blazer error. The score would remain 4-1 in favor of LeTourneau until the top of the fifth when the YellowJackets used a walk and hit-by-pitch to put two runners on before a Gonzalo Sosa RBI single brought junior Lee Hosie home to put the score at 5-1 in favor of LETU. A two-run fifth inning for Belhaven cut the LeTourneau lead down to 5-3 as back-to-back two-out RBI doubles drove in a run each as the Blazers did all of their damage with two outs in the inning. Four runs for LeTourneau in the top of the eighth proved to be the big inning for the YellowJackets with Bradshaw delivering a two-out, two-RBI single to score Birriel and Jacob Jones before Sosa hit another RBI to make the score 9-3. Belhaven would only score one more run in the game, using a sacrifice fly in the bottom of the seventh to bring home the final run of the game. An efficient YellowJacket offensive output saw the nine runs scored on nine hits, taking advantage of three hit batters and five walks issued by Belhaven. Only one YellowJacket collected multiple hits in the game, with Sosa going two-for-four with two RBI and two walks while Valdez had the only extra-base hit of the afternoon with a double. Three LeTourneau pitchers combined to allow a total of just five hits to the Blazers, with starter Andrew Harlan earning his second win of the year after throwing 6.1 innings and allowing four runs on four hits while striking out five batters. As of now, the series finale between the YellowJackets and Blazers is 1:00 p.m. on Saturday, April 14. Saturday’s forecast in Jackson calls for thunderstorms and rain likely, which could push back the final game of the series to Sunday depending on when the weather system makes its way into the area. JACKSON, Miss. 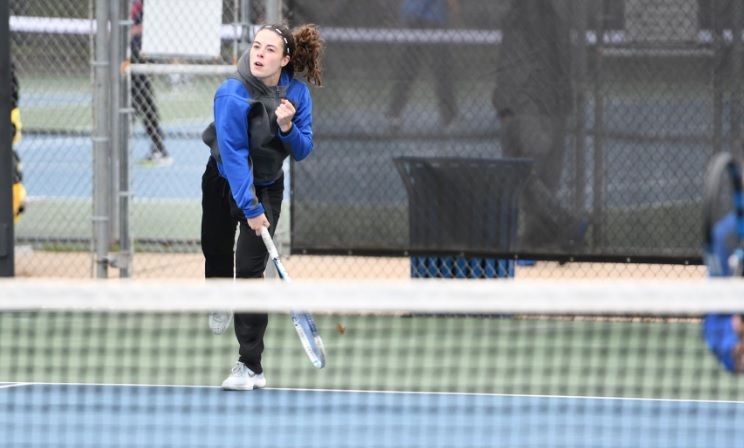 – For the second time in three matches, the LeTourneau University women’s tennis team put together one of their most complete performances of the year to defeat Belhaven University by a final score of 9-0 in Jackson, Mississippi on Friday, April 13. The win gives LETU a 7-8 overall record and 2-1 ledger in the American Southwest Conference while the Blazers fell to 2-12 overall and 0-3 in the ASC. LeTourneau came out strong, picking up two 8-0 victories en route to winning all three doubles matches. Maddison Brackenreg and Terin Murray took an 8-0 win at number one doubles while Gracie Favela and Katy Hall turned in an 8-0 victory at number two doubles. The only points given up in doubles play by the YellowJackets came in an 8-3 win for Lauren Rockwell and Samantha Trevino at number three doubles. Singles play proved to be dominant for LETU, with Brackenreg and Rockwell both earning 6-1, 6-1 straight-sets victories at number one and number five singles. Murray made quick work of her opponent at number two singles with a 6-1, 6-2 win while Favela earned a 6-1, 6-0 win at number three singles. The closest singles match of the day was a 6-2, 6-3 win for Hall at number four singles before Trevino closed out the 9-0 sweep for LeTourneau with a 6-1, 6-0 win at number six singles. A crucial road match for LETU is next in store when the YellowJackets travel to Marshall, Texas to take on East Texas Baptist University at 11 a.m. on Saturday, April 14th. The winner claims sole possession of the number two spot in the ASC East Standings heading into the final week of conference play. JACKSON, Miss. 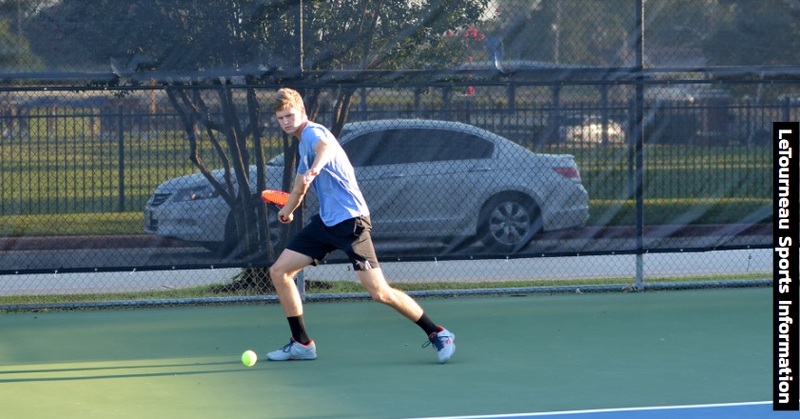 – Continuing their three-match road trip, the LeTourneau University men’s tennis team could not overcome a 2-1 deficit heading into singles play as Belhaven University took a 7-2 decision over the YellowJackets in Jackson, Mississippi on Friday, April 13th. The loss moves LETU to 3-12 overall while the Blazers improved to 7-7 overall and 1-2 in the ASC. The number one doubles duo of Christian Farris and Jimmie Henson earned an 8-3 victory to put the YellowJackets up 1-0 before seeing the number two and three doubles teams dropped close decisions. At number two doubles, Zac Crowley-Kurth and Cameron Wall fell by a score of 8-5 while Nash Best and Dale Wallace dropped a heart-breaking 9-7 decision at number three doubles. Trailing at the start of singles matches, LeTourneau would see their only singles win come at number two singles with Henson picking up a 6-0, 6-2 victory before seeing Belhaven take the other five matches. Crowley Kurth would go three sets at number three singles after taking the first set 7-5, but ultimately fell 6-1, 6-1 in games two and three in what would be LETU’s only three-set match of the day. Other scores saw Farris drop a 1-6, 2-6 decision at number one singles while Collin Patterson fell 2-6, 6-1 at number four singles. The number five singles match featured Best who fell 2-6, 3-6, while Wall played at number six singles in a 2-6, 4-6 defeat. A quick turnaround features LeTourneau returning to the lone star state to take on Highway 80 rival East Texas Baptist University in Marshall, Texas at 11:00 am on Saturday, April 14.